As a former racing driver, Toto Wolff’s interest saw him invest in Williams F1, moving up to become Executive Director and seemingly being groomed as part of the succession plan for the team. However, at the start of the 2013 season, Wolff defected to Mercedes, taking control of the motorsport activities of the German manufacturer and becoming a shareholder in them as well. Toto Wolff raced in some Austrian and German national formulae during the 1990s, with a highlight win in his class at the 1994 24 Hours of Nürburgring. Across the millennium, he continued to race in GT championships, before turning his attention to rallying. He became Vice-Chairman of the Austrian Rally Championship and found management to his liking. Having invested in several high tech companies, Wolff bought a stake in a company heavily involved in the DTM championship, with links to Mercedes-Benz. It was to Williams that Wolff turned for his first Formula One investment, however, becoming a shareholder in late 2009. A couple of years later, he was announced as an Executive Director at the team, and appeared to be lining up as a big part of the Williams’ team succession plan. In January 2013, Wolff surprised F1 circles with confirmation that he would be moving to Mercedes, retaining a similar shareholder/Executive Director role at his new team, whilst also keeping a stake in the Williams outfit. Wolff is also married to Susie Wolff, who is a development driver at the Williams team, continuing his ties at Grove despite his attempts to move onwards and upwards. With Ross Brawn’s retirement from Mercedes at the end of 2013, Wolff becomes the figurehead of the team, in charge of guiding them through all their F1 and motorsport activities. The new go-faster stripes have something to do with road car synergy and something Toto Wolff calls 'electric intelligence'. As everyone knows, blue swirly stripes are the international sign for electricity.A cynic might suggest that painting your car so it looks like it is eco-freiendly, while actually being powered by fossil fuel is somewhat disingenuous. We'll call this a 'bluewash'. Not content with just revealing a launch time, Mercedes have gone for a full on schedule - all times in GMT:12:10 - 360 degree Silver Arrow unveil14:40 - Toto Wolff Q&A15:45 - Lewis Hamilton Q&A16:25 - Tech Briefing18:30 - Valtteri Bottas Q&ALong day! The two Mercedes drivers starting on the front row together will worry Toto Wolff, who has never looked so angry as he did after their collision in Austria. He's said there'll be no team orders, but that the Rules of Engagement have been tweaked. This means war! 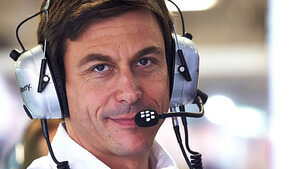 Toto Wolff: "From a team’s perspective we have looked at the pictures. It’s not clear cut. Nico had a good turn one and turn two. Lewis tried to dive in, Nico closed the door. I would say let’s wait what the stewards say. For us, it’s not a situation where you give 100% of the blame to one of the drivers. "Both of them were upset about the situation. They know what effort went into building the car and the engine, and there wasn’t any finger pointing. We’re beyond that." Toto Wolff: "We had some worries with both of the cars during the race. We’re happy that we finished. We had a water leak problem on Lewis’s car which stabilised when he took it a bit easier. The other car we had an issue where we were getting some strange signals from the power unit."